This week we just can't get away from solar power. 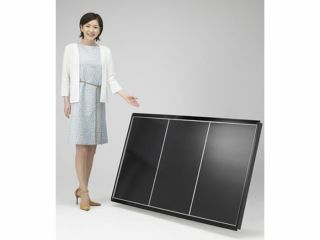 The latest intriguing Far-Eastern technology to cross our path is a new method for manufacturing domestic solar panels that are easy on the environment even before they're plugged in. Honda Soltec 's newest take on panels - built by its more famous parent company for it to sell - are next-generation CIGS cells. (Copper, indium, gallium and selenium are their major ingredients.) They go on sale this week for ¥60,000 (£250) each. The latest panels are 1.4m across by 80cm high and weigh 14.3kg each, making them suitable for roof mounting or as free-standing sun traps. Each generates a pretty standard 125W when pumping out the electricity at full power. However, their selling point lies in those CIGS elements allowing Honda to reduce CO2 emissions when actually manufacturing the panels. That, of course, comes on top of zero emissions when in use powering our gadget-packed houses. As if the greener-than-thou brigade didn't have enough to crow about.